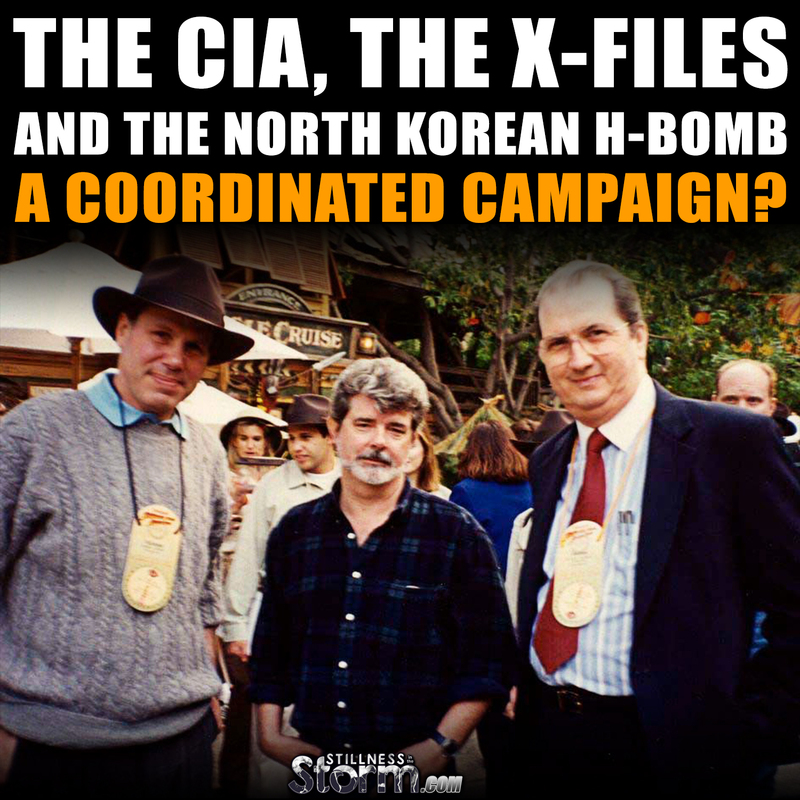 The CIA, the X-Files, and the North Korean H-bomb: A coordinated campaign? …So clearly, this is a coordinated campaign to put certain ideas into people’s minds. But what ideas are they trying to implant? 1) The first dialog is offered at the 27:23 mark, and it features Mulder speaking with a old doctor who was a first-responder at the Roswell UFO crash site. 2) The second dialog is offered at the 32:20 mark, and it features Mulder, Scully, a conservative TV host, and a UFO abductee talking about the overall conspiracy. 1) This narrative upholds the alien scenario that the Rockefellers, the Jesuits, and the Vatican have been trying to sell us: that friendly, advanced aliens have shown up to help us avoid self-destruction, especially annihilation due to a nuclear holocaust. It also supports the scenario I wrote about in “End Times” Programming: that the globalists will use black-budget aerospace craft and GMO humanoids to fake an “alien intervention” that stops nuclear war this September. If the Rockefellers, Jesuits, and Vatican are trying to convince you that friendly aliens have come, what does that tell you? That either there are no aliens or they aren’t friendly. So if something looking like friendly aliens shows up to stop a nuclear exchange this year, it is either human beings faking the intervention or hostile aliens pretending to be nice guys by saving the day. Of these two options, the former seems the more plausible one. Was this a simple mistake made because the show’s writers didn’t know the difference between a fission bomb (the kind that destroyed Hiroshima and Nagasaki) and a fusion bomb (the “H-bomb”), or was this a deliberate mistake that counted on the public not knowing the difference? If this was a deliberate mistake, why did they choose to specifically mention the “H-bomb”? With North Korea testing an H-bomb, openly threatening to use it against the US, and preparing to fire off a missile, are the globalists preparing us to see increased UFO activity due to the increased thermonuclear threat posed by an “irrationally-governed rogue nation”? Will this increased UFO activity lead to a full-on intervention later this year? Here’s an even more direct question: when North Korea conducts either the currently-planned or a future missile launch, will a “mysterious object” (UFO) be spotted near it before it explodes in midair or crashes harmlessly into the ocean? Will the US be miraculously saved from a North Korean “EMP attack” disguised as a satellite launch? So the CIA/Hollywood complex is suggesting that secret scientific studies were done on crashed alien spacecraft and alien corpses, and that the alien abduction phenomenon was a human-directed effort to blend human and alien genetics. Since they are suggesting this, though, we know it’s a lie. What, then, is the truth they are attempting to shield with this lie? That the electrogravitic propulsion technology of the UFOs is human technology, and the genetic material they are attempting to fuse with humans is of animal and synthetic origin, not “alien.” And why would they want to hide this? Because saying that it all started with Roswell and a government cover-up deflects attention away from what really happened and who is really behind it. In all likelihood, “UFO technology” originated from discoveries made in the late 1800s and early 1900s, which was the age of Nicola Tesla and other such scientific titans. In fact, Tesla himself had an association with J.P. Morgan that may have led to a transfer of ideas to the banksters. After picking his brain, they starved him of funding and likely developed his ideas in their own secret research programs. 1) The foo fighters first appeared over Germany. Given that Germany is an Illuminati stronghold, that the Germans were technological leaders in that era, and that the Nazis were funded by the London Establishment, it makes sense that the Occulted Powers based their electrogravitic research project there. 2) The foo fighters never displayed hostile behavior. This means that they weren’t the result of a government-level research project; they came from the people who operate above the governments. And since World War 2 was deliberately created by the Occulted Powers, their electrogravitic craft didn’t intervene. 3) The foo fighters were first spotted in November of 1944, but the very first atomic explosion (the Trinity test) didn’t occur until July of 1945. So clearly, the UFOs didn’t show up due to “aliens” responding to the detection of nuclear explosions. Pondering these points, one wonders if the Roswell incident was the result of an Illuminati electrogravitic craft crashing and being found by the US military. Did the Occulted Powers pull strings to take it away from the military and cover it up? As for genetic technology, it likely followed a similar development process. Biotechnology developed in secret labs progressed at a much faster pace than that of public labs. In a public lab, scientists must go begging for funding and are limited in what they can do by ethical concerns. In bankster-funded secret labs, though, resources are practically unlimited and no ethical concerns are allowed to inhibit research. For this reason, all sorts of sad creatures were likely created as the scientists experimented with different blends of human, animal, and synthetic genes. When the so-called “aliens” show up, you’ll see the results of all that work. And you’ll see their crowning achievement when the “angels” show up in 2023. MULDER: 60 years ago we were warned about the military industrial complex gathering too much power. MULDER: World leaders signed secret memos directing scientific studies of alien technology and biochemistry. O’MALLEY: But it’s not hard to imagine… a government hiding, hoarding… alien technology for 70 years, at the expense of human life and the future of the planet. Driven not only bycorporate greed, but… a darker objective. O’MALLEY: By a well-oiled and well-armed multinational group of elites that will cull, kill and subjugate. 5) the Mafia and other sanctioned criminal groups. Did you notice how NONE of these five groups was mentioned as taking part in the alien conspiracy? And why is this? As I said before, the CIA and Hollywood don’t want you to know what’s really going on and who’s really behind it. They want you to believe in benevolent aliens so they can pull off the next step of their “End Times” plan to unite the world under a theocratic dictatorship (and have us believe it’s a paradise). SVETA: What are they trying to do? MULDER: That’s the missing piece. O’MALLEY: But it’s not hard to imagine… a government hiding, hoarding… alien technology for 70 years, at the expense of human life and the future of the planet. Driven not only by corporate greed, but… a darker objective. MULDER: The takeover of America. O’MALLEY: And then the world itself – by any means necessary, however violent… or cruel… or efficient. By severe drought brought on by weather wars conducted secretly using aerial contaminants and high-altitude electromagnetic waves. In a state of perpetual war to create problem-reaction-solution scenarios to distract, enrage and enslave American citizens at home with tools like the Patriot Act and the National Defense Authorization Act, which abridged the Constitution in the name of national security. The militarization of police forces in cities across the U.S. The building of prison camps by the Federal Emergency Management Agency with no stated purpose. The corporate takeover of food and agriculture, pharmaceuticals and health care, even the military, in clandestine agendas, to fatten, dull, sicken and control a populace already consumed by consumerism. O’MALLEY: A government that taps your phone, collects your data and monitors your whereabouts – with impunity. A government preparing to use that data against you when it strikes, and the final takeover begins. As you can see, they paint a scary scenario, and what they are describing is the Evil Western Decoy NWO. This Decoy New World Order is being widely publicized in order to scare people, and with the PROBLEM presented by this NWO creating the REACTION of fear, the globalists are hoping that everyone will welcome the SOLUTION, which is the multilateral / multipolar NWO being brought in by the BRICS Alliance. If you wish to understand how the two “competing” NWOs are being used to advance the globalist agenda, read Understanding the NWO Strategy. DOCTOR: Because you weren’t even close. Warring aliens lighting each other on fire and other such nonsense. MULDER: Alien technology being used against us. 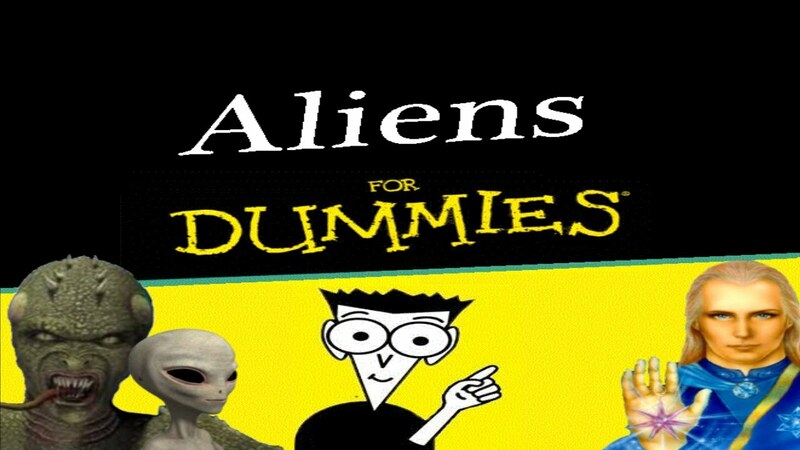 Not BY aliens, not WITH aliens, but by a venal conspiracy of men against humanity. the benevolent Nordic swimsuit models from the 5th dimension. As you can see from the X-Files quotes, they are now specifically ruling out any warring factions and are seemingly ruling out reptilians too. Perhaps the globalists finally decided that “evil space lizards” would be too hard to sell, so they settled with a slightly more plausible scenario: that the technology came from crashed alien spacecraft, and it was used by the government to abduct humans for human/alien genetic testing. 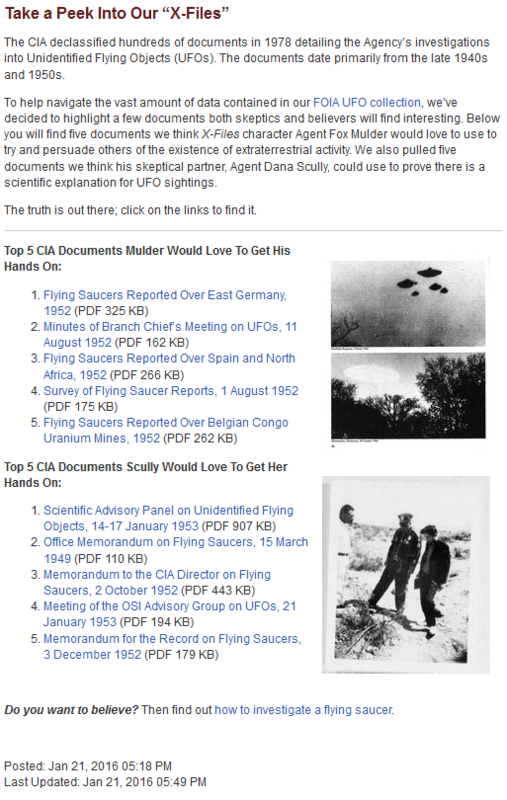 Since the X-Files will reach a much broader global audience than any fringe alternative media site, and since the CIA is helping to promote the show (and by extension, its narrative), we may be looking at the final version of alien deception script. And as I’ve pointed out, it’s full of holes. Good luck selling that sh*t, fellas. More than anything, the globalists want you to believe in benevolent aliens, at least for now. This is because they are planning to send in their electrogravitic craft and GMO humanoids (posing as UFOs and aliens) to save us from a staged nuclear exchange this September. They want to totally blow people’s minds, and once those minds are blown, they will construct a new paradigm in them which will facilitate the rest of their “End Times” agenda. One wonders what would happen if they put on their big UFO show and the whole world yawned. Let’s spread the word on this deception so we can find out. > North Korea will be ready to fire an ICBM capable of reaching the US West Coast just in time for the Super Bowl, which is being played on the West Coast. Can anyone see how this whole situation has been coordinated to produce a dramatic moment? 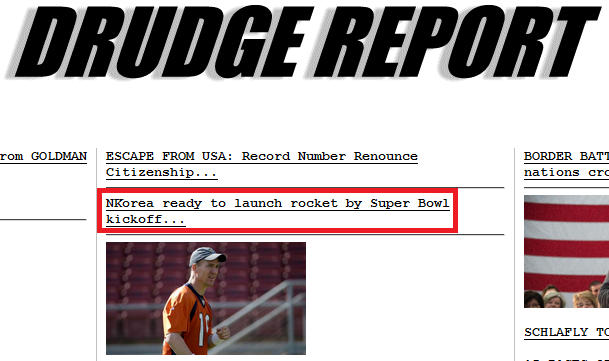 What will happen if North Korea fires the missile in the direction of the West Coast during the Super Bowl? Will the networks pause TV programming for a news alert? Will the missile defense systems be able to stop it? If they miss it, WHO WILL SAVE THE DAY? But will they even try this now that the plan has been outed? (P.P.S. 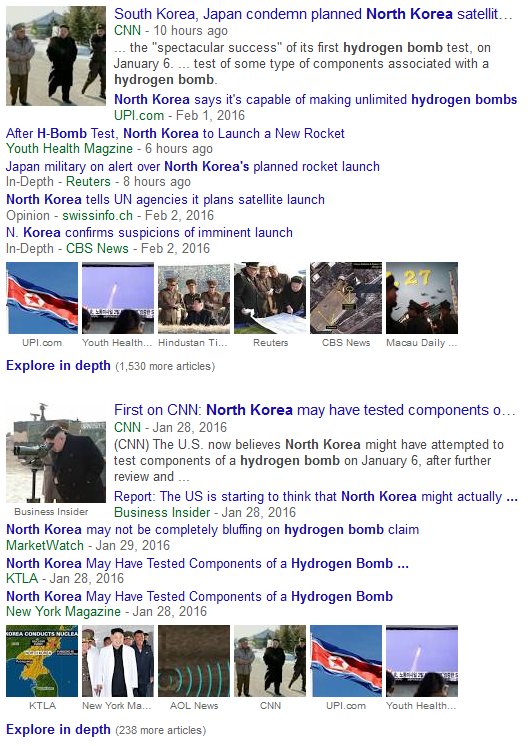 – Same Day) – North Korea has fired their missile, so if they had any drama planned for this launch, it was aborted. It’s also possible that this was just a warm-up for an upcoming missile incident.